I ended up using a 2 for 1 in CE a couple of weeks ago LCY – LIN. Terrible waste but would have expired otherwise, and I fancied trying LCY for first time. Overall experience was pleasant, crew were really good. Security was slow though (8am) which is one thing I was not expecting although there were quite a few delays that morning that might have something to do with it. What made the redemption a good result was our flight was delayed over 4 hours so have just received £426 EU comp. Hotel paid for! I did the same a few years ago and it looks like I might need to do it again as I have a 241 expiring in 6 months and no options to use it as yet due to circumstances. I know there’s no lounge, but if it means saving the long journey to Heathrow or an overnight stay to get an early Gatwick flight, I’d rather burn it at LCY. That’s interesting. You got compensation even for an Avios redemption flight? Have you got it yet? I agree with Rob about the lower value, though economy seats rarely available from City to Edi, at least with the sort of lead time I book, so I do sometimes use CE. However I’ve just discovered how easy it is to get to Gatwick from London, thank to Rob’s piece on rail links, so that might now be my route of choice. (Though bizarrely I found the price of a single rail ticket to London Bridge was still £17.50. I thought it was about a tenner and only the Gatwick Express trains were £17.50. Yep for both of us. Got the compensation the other day, applied for it on the 15th. btw for getting to Gatwick have you tried using oyster / contactless? £8.50 off peak from VIC so should be similar from London Bridge? Oops, got that the wrong way round. Peak is 06:30-09:30 and 16:00-19:00. TFL don’t mention the evening peak slot unless you look carefully. I got caught out and charged something close to £18 for coming in to Gatwick going to London Bridge and then changing for zone 2 on the tube. My journey started at around 3.30, but finished at 4.30pm. Last month I just went to London Bridge and bought paper tickets from the office for £21 return, outbound off peak, return was during the morning peak. Fed up with the randomness of contactless fares when using rail. 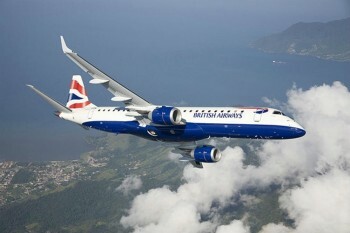 I would encourage BA to take a tip from SWISS when it comes to business class on a 2×2 aircraft. They only sell the window seat and leave the aisle seat free. Worth mentioning that you should do your sums. Depending on how you value your Avios, twice this year so far it’s worked out cheaper for me to book into economy cash basic fares (check the specific fare bucket though – must not be G, O or Q) and then call and upgrade with Avios. Then the flights also earn a few Avios & TPs/count for status. I know that companion vouchers shouldn’t be used ideally for CE flights etc, but we have 3 vouchers to use ATM, with one expiring in the next 6 months and so with the loss of amex bonuses we’ve used one to get 3 bus class return flights for our summer holiday to PMI from MAN, for 60k avios and £150. Priced up the same flights which are showing a £1200 so we feel like we’ve got some value. We’re using one of ours for a family trip to Rome at Easter in CE (we had a bumper points and voucher collection year last year thanks to HFP!) and I feel it’s decent value as it’s an expensive time to travel. Lol – just read the story on BBC. I hope someone who reads hfp was on the flight and can give a low down on how no one noticed until it was on approach to Edinburgh. At least it was a beautiful morning here today! Surely that’s two segments with Double Avios and Tier Points for the price of one! I would definitely have noticed if there had been no or only modest cloud cover. Although I would anticipate that it would be very difficult to make the average member of cabin crew believe me and bother to talk to the captain about it. But on a solidly cloudy day the the only way to notice would have been if one had a BA in flight map (probably not available on an Embraer although can’t remember now). Was it a solidly cloudy flight when this happened? No mention of the weather at the time and whether the ground was visible in the media coverage. Surely it must have been cloudy virtually all the way for no one to realise. On the other hand I very often feel like I’m one of the few people on a flight who actually properly looks out of the window and takes in the things I am seeing below me. I also reckon if I had been on board the ill fated Helios Airways 737 flight that failed to pressurise I might have noticed what was going on from the altitude gauge on my Casio watch as it started to show cabin pressure of way over 10,000 feet. I’m in Glasgow and I can tell you that yesterday was clear blue skies. Quick one – is there a way to upgrade (using avios) an economy ticket that was purchased through my corporate travel office? BA website says no if I try via Manage My Booking. Can it be done at the airport maybe? Looking at a LHR-DUB flight. You cannot upgrade non-refundable flights for Avios. Full stop. If it is semi-flex or flex then ring BAEC, they can do it. The website plays up if it wasn’t booked via ba.com. Norwegian rejig. I’d prefer Dreamliner anyway. It is cool – I am going to review it again this year, I haven’t done it for 10 years so predating HFP. Do it whilst it lasts, I think. With more Brits having Global Entry the benefit of clearing US immigration in Shannon is becoming more of a pain than a benefit. Even without Global Entry the new electronic immigration terminals are very quick – certainly quicker than the time you spend in Shannon. Note that you cannot use the terminals if you have not visited the US since 2008. The 2-2 seating out of City will also start to look archaic once Club Suite is here. I have a funny feeling it’s here to stay, but in a different format: direct both ways in a B737 MAX or A220 (Bombardier CS300) both of which I think have the range and the short-field ability. A small CBP operation in LCY is prob over the top but maybe possible. It must be a normal Business class redemption but I don’t know what the availability is like. Would be interesting in its own right but I have already been to JFK and NYC too many times to justify making a special extra leisure trip just to try this out. Although I did fly to JFK and back in October 2003 specifically only for the purpose of getting one of the last ever Concorde flights back to the UK. Outbound to JFK was in First Class as I was travelling with a BA Amex card holder who had qualified for a free companion flight and had managed to find Concorde availability after months of repeatedly checking for such a possibility.